Looking for a school which will help you be ready to the real-world environment? 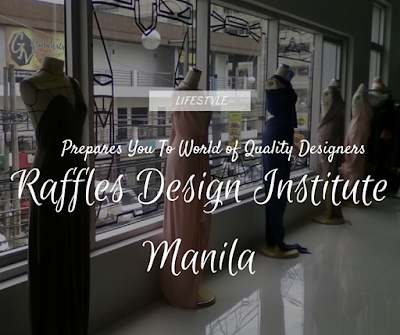 Raffles Design Institute Manila is an international college offering professional education for the following disciplines: Fashion Design, Fashion Marketing and Management, Visual Communication, Interior Design, Business with Specialization. Established last September 2010, Raffles Design Institute Manila was originally located at Accalaw Tower in Bonifacio Global City, Taguig City. Presently, they are now located at Metropolitan Avenue in central business district of Makati City. A 4-storey building with rooms equipped especially for subjects & courses offered. (From left to right) Reception, Mac Room and Drafting Room. Raffles Design Institute Manila is a part of Raffles Education Corporation Ltd, an undisputed leader of design and business education in the Asia-Pacific region that currently operates 30 colleges in 28 cities across 13 countries globally: Australia, Cambodia, China, India, Indonesia, Malaysia, Mongolia, Philippines, Saudi Arabia, Singapore, Sri Lanka and Thailand. (From left to right) Library, Sewing Room and Interior Design Studio. Fashion Design - Develops the in-depth understanding of wearable art through exploratory and experimental projects. Creativity and technical proficiency will bring you abreast in this fast-paced industry. Fashion Marketing & Management - Provides solid grounding of business knowledge, contextual studies and the most recent industry focused marketing practices for the stylish and business savvy. Interior Design - Focuses on the human interface within a space by executing intensive architectural and design solutions. Visual Communication - Explores the economic and socio-cultural implications of various design solutions to hone multidisciplinary skills through major practical projects. Business with Specialization - Develop professional skills and qualities needed to become a successful decision maker to propel your team and break through a competitive market. (From left to right) Draping Room, PC Lab and VC Studio. Jumpstart your career by attaining one of the many internationally-recognized design and business qualifications via their fast-track education pathways. Learn the best in international professional practice from their disperse academic team of professional practitioners hailing from all over the world. Ready oneself for the real world by learning from their global networks, real-life working environments and industrial internship programs.